I bought this 'Birdie's Perch Coffe Shop' puzzle in a local drug store for about six bucks. I suspect you can find them in your town or on the net. I built this little building just for fun. Anytime you build something like this it always gives you ideas for other projects. 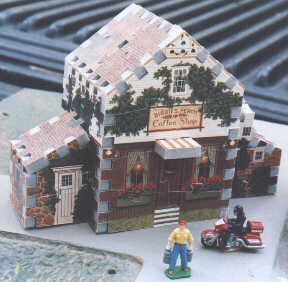 The box mentions other buildings in the 'Miniature' series. You may be familiar with the Titanic or Notre Dame puzzles put out by this same company. The box mentions Wrebbit, Inc, Milton Bradley and Hasbro, Inc. This might also be a way to get kids involved in the hobby.